A long time ago, as my friend Jim was building the masonry stove in the house on Asbury Street, we got into a discussion about whether it’s satisfying to be right all the time. Jim is an intelligent and conscientious craftsman and at the time he was very invested in getting things right. And, “rightly,” a lot depends on that, especially in a complex building project. But the turn of our conversation had veered far away from such practicalities and into the philosophical. I told him that although I was often right myself, I’d rather be surprised and enlightened any day of the week. He seemed to agree, but I wasn’t absolutely sure that he did. After that every once in a while I’d wonder if I’d recognize when the time came to choose one or the other, and if I would indeed choose to be surprised and enlightened when I could. I don’t know if I see that opportunity every time it comes my way, but I’m always glad when I do. One of the very few things I was a little disappointed about when I first saw my new house was the fact of the old electric range in the kitchen. 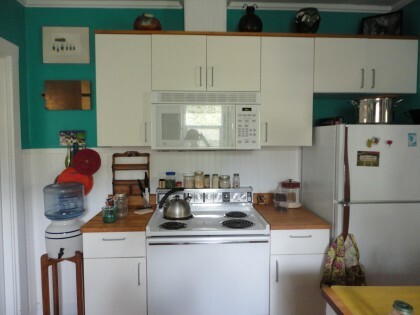 When I lived in the yet-to-be-called Yellow House across from the blue house I was yet-to-buy on Asbury Street, the remodeled kitchen had a gas stove. It was the first time I had ever used one, and I fell in love with its fiery alacrity. It’s certainly not that I’m a fastidious cleaner of stoves, but I liked how it all came apart so that you could clean it. Even the top lifted off easily. I thought there was nothing finer. When I moved to the blue house across the street, there was an old electric range there too. As soon as I could afford to, I had the gas line extended so that I could put in a gas range. I bought a used one at a local appliance store; I was told it had served in the cooking classes at the Junior High School. For some reason, this made me quite merry. I felt that if it could survive teaching 12 and 13 year olds how to cook, it was tough enough to have a long life in our tiny bustling kitchen. And I was right. Oh, how i loved that gas range. The latent survivalist in me loved that if the power went out, I could light the burners with a match (which I did more than a few times). I learned how to cook without oil on that stove top. And I baked so many gluten and fat free muffins and other goodies in the oven that I had to have the heating element replaced. But on it powered. I swore I would never go back to electric. But life has a way of happening after I make such pronouncements, of proving me wrong enough to laugh at myself after for thinking I know just what’s “right.” When I saw that the otherwise perfect kitchen in my new house did not have a gas range–ah, well, I thought. And paused. I asked the young husband what they did when the power went out. He looked at me funny and said he couldn’t remember that happening. 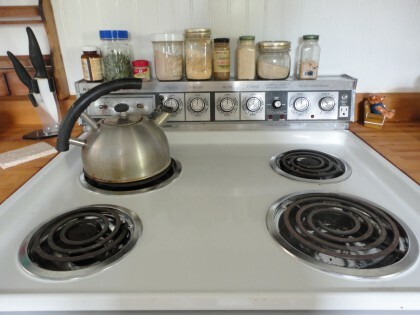 But he also assured me that it wouldn’t be hard to put a gas range in, since just across the floor in the tiny living room adjacent to the kitchen there is the kind of gas stove that heats a room (replete with fake logs in the window of its glass door). There are so many other things about the place that I fell absolutely in love with–like the turquoise walls in the kitchen you can see in the photo below–that I thought this was something I would try to live with until I could replace it. What I didn’t expect was to be surprised and enlightened by this old Kelvinator electric range. When we were first setting up the kitchen, Mike said it may be electric, but it sure looks cool. That it “went” with the kitchen. Begrudgingly at first, I had to concede he was right. Then Kelly and I had some adventures trying to figure out how to know when the oven came to temperature. I’m still not sure how to tell that (since the oven thermometer inside it seems stuck at 325), but I have been delightfully pleased with everything I’ve baked in it, from Kelly’s quesadillas to sweet potatoes to a banana bread recipe that’s coming soon. But the real surprise and enlightenment came from making something as simple as my morning cup of peppermint tea. Sure, it takes longer for the water to come to the boil. And it doesn’t boil with the ferocity it once did on the burner of the gas stove at the Asbury Street house. So I expected a weaker cup of tea. But the fact that the boil is more gentle helps it come off the boil more gracefully, which makes for a more refined cup of tea, one in which the taste of the mint literally floats in the hot water almost immediately. No scorching of the tongue, no waiting for it to cool down enough to taste like a cup of tea. The tea bag steeps immediately. And though this shouldn’t be the surprise of all surprises to me, it is; this slow miracle gal actually LIKES the slowness of the electric stove. I can actually turn it on and let the pan heat up without burning the pan. And I am not burning things or boiling things over like I usually do. The need to be able to take everything apart to clean it properly is far less urgent. Even my friend who comes to help me clean looked at it and said, almost incredulously, that I’d kept the stove really clean. I was even able to cook my millet without it boiling over into the hinterland beneath the burner coils. I may not keep this stove forever, or its time may be up before I’ve decided to replace it, but I sure do like its quiet way of making the perfect cup of tea, and how I can actually “lightly brown” something without burning it, or the delicate way my favorite combination of rice and quinoa tastes when I cook it together on this old stovetop. It never occurred to me the whole time I was using what I thought was my “perfect” gas stove over at Asbury Street that I might actually prefer an electric one for the way I now cook and the food I now eat, and the pace at which I go to prepare it. Now I don’t have to hustle as if I’m taping a cooking show, and things turn out better than I could have imagined. Yet when I was cooking on my gas stove at my old house, I couldn’t imagine the things i was making turning out any better than the way they cooked up on that stove, and so I was happy with it. But when I moved here and began using this old Kelvinator, I realized that I liked the different way they cooked up on it more, not less. I never would have thought this possible, but it’s true. And so it is that once again I am surprised and enlightened. This surprise and enlightenment leads me to reflect that rushing around my tiny old kitchen as if I WAS being taped for a cooking show is symptomatic of something very old in my behavior, that comes from very early knowledge that the world without cerebral palsy moved much faster than I could, and if I wanted not to be eaten alive by it, I had better at least give the impression of effort to move faster than was really natural for me. When the world gets divided between the illusions of “normal” and “not normal,” anything that appears to fall into what seems like magical “normal” is unquestionably “better” or “right.” Anyone who has ever known the misery of being one of the last to be picked for a game of kickball or dodgeball will appreciate my consolation prize with a rueful smile. As the shiny team captains and their cohorts debated over us “clearance items” as if we were rotten fruit, encouragement to pick me second-to-last usually came with the whisper “At least she tries.” Thus the lesson to go faster than felt like “home” to me–and all the mishaps that came with it– was powerfully enforced. Perhaps its a long stretch to make a connection between childhood dodgeball and the electric range in my new house. But when I think about it, not so much. Because what it means to live in this house is to acknowledge I want to be more quiet, be free to move at my own pace, have less to “catch up” with all around me, so I can find more readily how to move according to my own rhythms and needs, not those of the traffic hurrying in and out of town, or the students rushing too and from classes, or those escaping that discipline to haunt the bars downtown and then stagger back home. It’s not that we shouldn’t try or strive. I think it’s just important to examine what it is I am trying to do or striving for. Some things become so automatic and unspoken that it takes the decades between grade school and approaching sixty to notice the messages are now obsolete. And it’s not about whether to have a gas or an electric range. It’s more about the metaphorical nature of reality I sometimes refer on this blog to as the one I believe in. I look to what these things feel equivalent to in my own experience, and then I know how to understand them. We don’t think going more slowly is going to be more fun, that it will yield hidden richness. We aren’t taught to expect that. We’re taught to believe it’s an insufferable bore. That’s why this perfect cup of tea coming off a slower boil in my kettle on my new-old electric range is such an unlikely but noteworthy gift. I thought I would feel at home in this cozy little house surrounded by trees. I thought I would like the quiet here. That I would enjoy sitting out on the deck, or looking out the studio windows, or writing on the chalkboard in the kitchen, putting away all my stuff in the many cupboards, looking up at the stars at night, unhindered by the neon of the laundromat and the Subway sandwich shop. I knew I would love the deep richness of the old red fir floors. But I didn’t think I would find that the old electric range made the perfect cup of tea or the perfectly golden–not brown–quesadilla. The peppermint flavor is not boring at all. It’s “just right,”as Goldilocks would say. The orange burnish on the corn tortilla is just the right amount of toasted (acrylamide free) glaze. And that is surprising and enlightening. I love being wrong about something like this. What a lovely post! I’ve never had anything *but* an electric stove until purchasing a motor home. Then, I realized what all the fuss about gas was about! 🙂 I hope you continue to enjoy your electric stove. so much for me to learn from it. Such a beautiful post! I have been following you for about 6 months now and I look forward to each and every post. I have enjoyed the same enlightening regarding the electric stove. When I married the one thing I just knew I was going to miss was my gas stove. You see my new marital home is too far out in the boonies to have gas. Much to my shock and delight, the electric stove is wonderful! I noticed the difference in my tea as you did. And I do enjoy the slower pace in the kitchen. I am looking forward to your banana bread recipe. I have been tinkering with a gluten free, vegan banana bread recipe for the last year. Enjoy your beautiful new home! Welcome, Robin, and thanks for your wonderful comment! I so enjoyed reading about your own experience with returning to electric stove, and that the “forced marriage” turned out to be a boon for you, too! I’m glad you’re interested in the banana bread recipe. Thanks for the well wishes about my new home. This post was just beautiful! I want to put on my jammies and get some tea and re~read it!! Thank you so much! Welcome, Stephanie–it’s the best kind of compliment to hear that you want to reread this–and in your jammies with tea no less! I am honored. I’m happy to hear you’re settling in to the new place well! It sounds like a great place, quieter than before. Enjoy the perfectly brewed tea and quesadillas! My youngest son (17) is often invited to play a game with me, something I need to play a lot, it’s list all the reasons someone might have behaved a particular way, I get such a kick out of this when I have come up with everything and then he finds more ideas…Yesterday it was about why my friend hadn’t called/messaged and we had a huge list and then when I finally spoke to said friend, we both just laughed and laughed when it was something else again, something I just could never have come up with. Many years ago, I was a very ‘black and white’ person and now apart from all the colour in my life, I am as grey as can be!!! I I know anything,it is that I know nothing. And sometimes I forget this too! Oh Deborah, thanks for sharing this wonderful fun you have with your son about “reasons”!! Loved it. I am a funny combination of thinking it’s funny when I’m wrong and being very stubborn about things I know in my heart are right for me. Here’s to all the colors and the grey in between. Thanks for your kind words–gentle hugs and giggles back! Thank you. I’m sure it was not your intent, but I feel much better about the possibility of ending up with an electric rather than the gas stovetop I am used to as we continue on our house hunt.